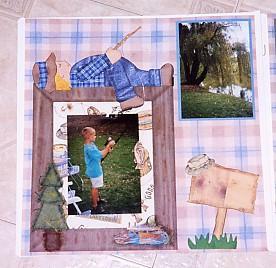 This was the layout I did for JoJo for the BH Swap:) The boy fishing on the frame is a paper piecing-tree is mulberry paper. There is line and a fish-button hanging from his "pole". His hair is "dmc-floss"